"Snack Factory® Pretzel Crisps® are topped with a creamy habanero cheese mixture and slices or sweet pepper, broiled, and finished with sweet chili sauce and another Pretzel Crisps®." 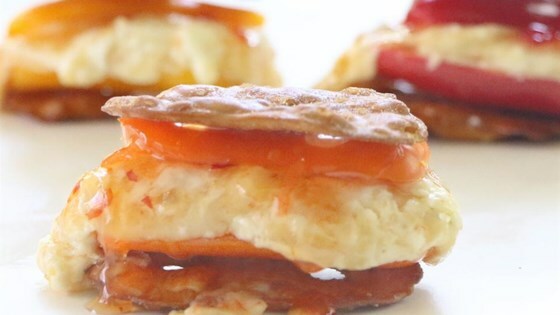 Combine the whipped cream cheese and shredded habanero cheese. Place a dollop on each Snack Factory(R) Pretzel Crisps(R). Top with a few slices of bell pepper. Melt slightly under broiler or in a toaster oven. Top each with sweet chili sauce and another Pretzel Crisps(R). See how to make cherry peppers stuffed with Italian sausage.